The Samsung Galaxy A3 and Samsung Galaxy A5 are both now available for purchase in the U.S. unlocked and SIM free. The handsets are being offered by Expansys USA, priced at $329.99 and $409.99, respectively. Both aluminum clad models are also being offered with free shipping. 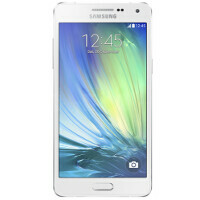 The Samsung Galaxy A3 features a 4.5-inch Super AMOLED screen with resolution of 540 x 960. A 64-bit quad-core 1.2GHz Snapdragon 410 CPU powers the phone, while the Adreno 306 GPU handles graphics. 1GB of RAM is onboard, along with 8GB of native storage. A 64GB capacity microSD slot is ready and willing to add memory if necessary. The camera on back weighs in at 8MP, while a 5MP "selfie" shooter can be found on the front of the phone. A 1900mAh battery keeps the lights on, and Android 4.4.4 is pre-installed. The phone is available right now in white. The Samsung Galaxy A5 is equipped with a Super AMOLED 5-inch display, offering a resolution of 720 x 1280. The same Snapdragon 410 CPU and Adreno 306 GPU found on the Galaxy A3, is employed on this model. 2GB of RAM is inside the unit, along with 16GB of native storage. Of the 16GB, 12GB is available to the user. If more memory is required, a 64GB capacity microSD slot can be used. The rear camera weighs in at 13MP while the front camera is a 5MP shooter. The 2300mAh battery keeps the phone running, and Android 4.4.4 is pre-installed. This handset can be purchased now in black or white. More than half of the phones Samsung sells are mid range to low end. So lots of people and Samsung its self should care. They just made sure that 2015 will be even worse than the miserable 2014 was. speaking of miserable,my s4 lags bigtime even with the normal use!!!! thinking of cfw what can u suggest? Do a hard data reset, disable auto update, 90 % of the Android users don't know how, allowing auto update date to update all the junk apps, slow the phone down and drainning battery. I disable auto-update on my phone the nimutes I activate my phone, and GS4 never have problem. incase you don't know how. go to playstore, setting, press auto-update apps and check "do not auto-update apps"
S4 still is an actual phone. More of the today phones are coming with S410 and displays of around 1080p 5". If you disable some samy bloat you will have a nice working/playing phone. This is extremely pricey. I can get a m7 32gb for just 300$. Should wait and see whether the general consumer would buy this phone. This design is not the usual Samsung offering. Very similar to HTC without the ability to remove the battery and metal design. Personally, I will stick with their Note series. Removable battery, high end specification all the way and digitize Wacom pen. I notice the usual Samsung bloat signature is still there 4 GB taken up by system and third parties bloat ware. Guess a leopard will never lose its spot. For one these are dual sim. The m7 dual sim costs more than these if you can even find it. Also the cameras on the A5 should be pretty decent. I suspect it is the same on the back as the sgs4. Also they are imports and brand new so attract a higher price. You make no sense. Who cares about one stupid phone camera a little better than the other. And how do you know the Samsung camera is better? Secondly, dual Sim doesn't justify the high price of this low performance device. Lastly, imports should be cheaper and where Samsung get used phones to sell? You're an idiot. Yup, the M7 beats these expensive junks hands down. Meanwhile Moto cant stop laughing with its Moto G 180$. Seriously Samsung, you failed miserably 2014 cause of bad overpriced phones and you continue 2015 with same strategy? I am pretty sure Moto, LG, etc will be having an amazing 2015 year. Samsung and MS both. The supposed "affordable flagship" lumia 830 (with an SD400 and 1GB memory) is $449 off contract. lol. There were 2 joke in Lumia830, one was its pricing another was its OS. I dont understand what the sarcasm is about. You like the fact that a big company which almost has all the consumers in its pockets to rip off everyone with overprized BS?? how is it a rip off when you're not forced to buy it? Sammy made billions because people obviously like there products, and are willing to pay extra. These phones are obviously not aimed for the poor at this price. You're right. These phones are not for the poor, they're for the idiots like you. 5 inch display with 720p resolution lol. Are you talking about Apple? But moto g looks like a cheap Chinese toy. Actually most motorolas look this way. Though you have a point, both phones are a bit overpriced. Great price for what you get but still more compromises over the A5 - relatively thick, plastic build, 8mp so so camera, smaller battery. Higher Price is not going to help Samsung, selling these devices on large scale .. The price really DOES NOT justify the Hardware n Software package !! ..
A5 has low-end processor and small battery. PA has wrongly reported that A3 has 1GB of RAM. GSMArena correctly reports it to have 1.5GB. 8GB of storage is just a joke. 16GB should be made bare minimum for any device even if it has expandable memory. Pls don't screwHTC your products by giving 8GB of storage.